This post I am dedicating to my mother in law Monica, and my mother Claire. Monica's recipe is quick, easy and makes excellent light pikelets. My thanks to Penny who has gifted to me my mother's iron griddle or as the Scots call it girdle iron. 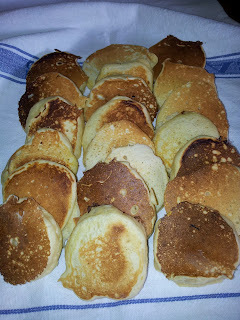 I have memories of Mum making batches of pikelets to feed the shearers. I warmly recall arriving home from the school bus to be welcomed with the smell of pikelets being cooked on this griddle. Four hungry kids meant that mum wouldn't even get the chance to store them under the tea towel. We would be lining up as they cooked. Pikelets are classic NZ fare and a treat you can whip up in a few minutes. They are especially nice if spread with some berry jam and topped with a dollop of cream. 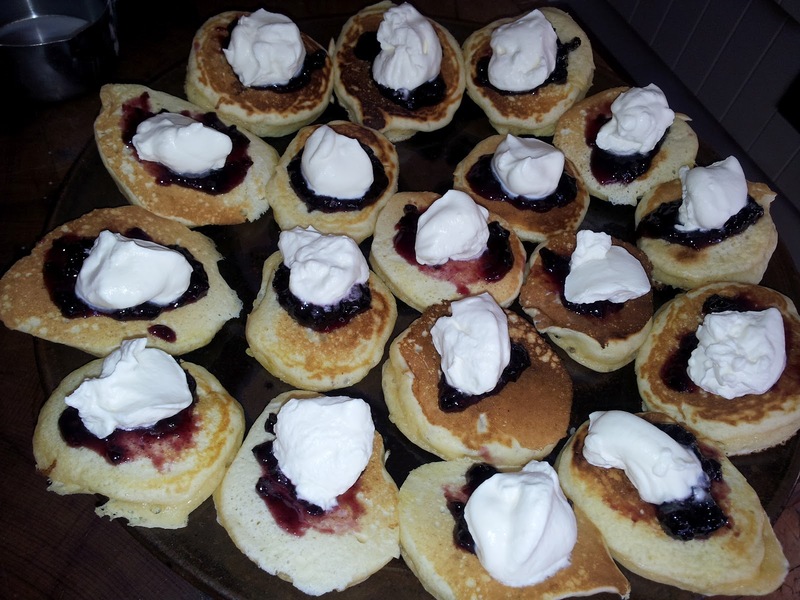 In Scotland pikelets are known as drop scones or dropped scones but really pikelets belong to the worldwide pancake family. 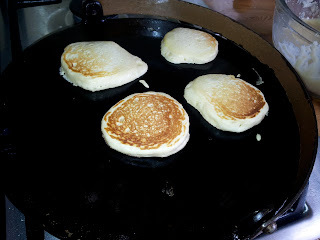 I have made pikelets on my cast iron skillet but its so much easier on a griddle iron because it has no sides so makes flipping easy. It is difficult with gas to keep the temperature down far enough and the iron seems to get hotter and hotter so you have to make sure you keep monitoring the temperature. Beat quickly to make a smooth batter the consistency of lightly beaten cream so that it will easily drop from the spoon but will not spread too thinly. Ideally leave this mix for 10 minutes before cooking ( usually I am making these in a rush so I start once the pan is hot enough). 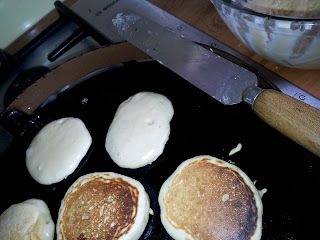 Always make just one pikelet first up as you have to get the cooking surface to just the right temperature. When one or two bubbles break on the top of the pikelets its time to flip them. If you have the temperature too high they will brown quickly but could still be raw in the centre. As they come off the pan store them in a clean tea towel as you do with scones. If you make crepes, dosas, pancakes or pikelets on a regular basis then it would be worth while hunting out for a griddle iron in a second hand shop or check if your grandmother has one in a back cupboard. Practise makes perfect and this is good recipe to make with your children. Looking forward to trying Nan's pikelets! Thanks to you Penelope Jane that they worked out so well! Carrots - eat lots of them!